​S​uspected kidnappers, who have been terrorising travellers and other persons in Akoko area of Ondo State, ​have been ​arrested by a special operation team of the Nigerian Army. The team was led by the Commander 32 Artillery Brigade, Owena Barracks, Akure, Brigadier General James A Ataguba. 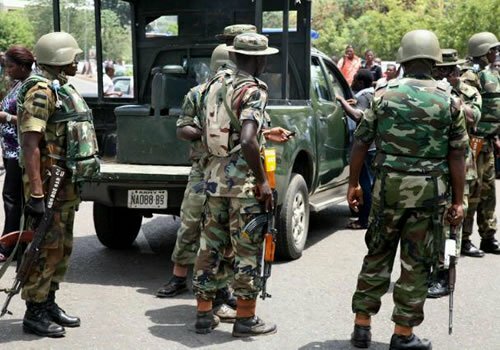 Public Relations Officer for the 32 Artillery Brigade, Captain Ojo Adelegan said the suspects were​ apprehended within the Akoko area of Ondo State. ​He said ​troops also raided spots and camps between Kogi and Ondo State​s​ in Akunu Akoko,​ ​Ohogo and Ogale communities. ​Also arrested with the kidnappers​ ​were their informants​. The spokesman added that all suspects would be handed over to appropriate security agencies for further action. Adelegan said that the operation ​was​ a follow-up of the rescue operation of some kidnapped victims at Akunu and Ose area last week by the brigade soldiers. The brigade advised the general public to always give useful information on any criminal activities through the Brigade call Center with the hotlines​:​ 09030002151 and 09030002151.